Medical Expenses: Generally, your employer and/or their insurance company has to provide you with medical care and treatment. This includes paying for all treatment options that they offer to you. However, there are some circumstances that they can be held responsible for paying medical expenses that you incur with medical providers not approved by them. For example, if your work injury claim has been denied, they lose control over your medical treatment. If your injury is later determined to be work related they would be responsible for the costs. There are other limited circumstances when you can seek medical care with a provider who is not approved and they will be required to pay for it. Mileage Expenses: You are entitled to be reimbursed at the rate of $.545 per mile after July 1, 2018 for all mileage you incur going to and from doctors' appointments, physical therapy visits, etc. 2. Money for Permanent Disability: If your work injury or occupational disease causes a permanent disability, also known as a permanent impairment rating or functional impairment rating, then you are entitled to money for the resulting disability. The amount of the benefits is based upon the body part(s) involved, the nature and extent of your disability and the amount of your average weekly earnings prior to your work injury. Note: even if you do not an impairment rating, but have been given permanent restrictions due to your work injury, then you may be entitled to additional compensation. (This is a very detailed subject covered in much more detail in an entire chapter in our book and on our DVD). 3. Right to Refuse Medical Care: You have the right to refuse any medical procedures or care that you do not want. For example, if the company doctor recommends surgery you do not have to proceed with surgery. However, please keep in mind that not proceeding with surgery may have an impact upon your case. 4. Weekly Benefit Checks While You Recover And Cannot Work: While you are healing and unable to work, you will receive weekly benefit checks to replace your usual earnings. This applies to both when you are completely unable to work (known as TTD- temporary total disability benefits) and when you return to work, but are working less than 40 hours per week (known as TPD- temporary partial disability benefits). The amount of your weekly payment is called your "rate" which is discussed below. Rate: The amount of your weekly benefit checks, also known as your "weekly benefits", is based upon your average earnings prior to the work injury, known as your AWW- Average Weekly Wage. If you are paid on an hourly basis, generally your rate will be based upon your average wages for a 13 week period prior to your work injury, excluding short weeks (weeks in which you did not work a full 40 hours). Your weekly rate is based upon your marital status, your number of exemptions, and your AWW- Average Weekly Wage multiplied times 80% of your spendable weekly earnings. There are both minimum and maximum rates for permanent disability benefits based upon the statewide average weekly wage. 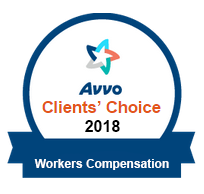 Our experience is that in about 50% of our cases, the employer/insurance company has underpaid the employee by using a lower weekly rate than what is owed. That is why in every case it is important to verify that you have been paid the proper rate as it can make thousands of dollars of difference. , how to avoid costly mistakes in your case, and much more then request of book now below. Why offer you a book at No Cost? 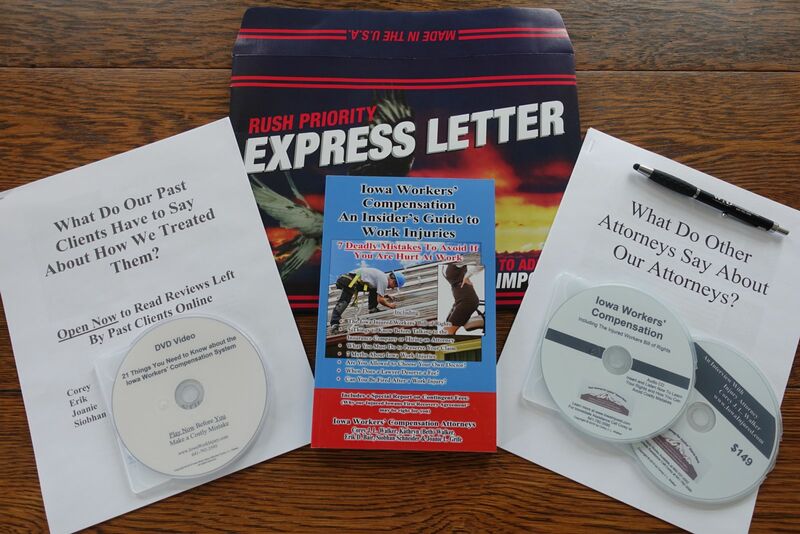 Because our attorneys have represented hundreds of Iowans hurt at work and seen far too many clients make mistakes before they had the "right" information resulting in them losing thousands of dollars. 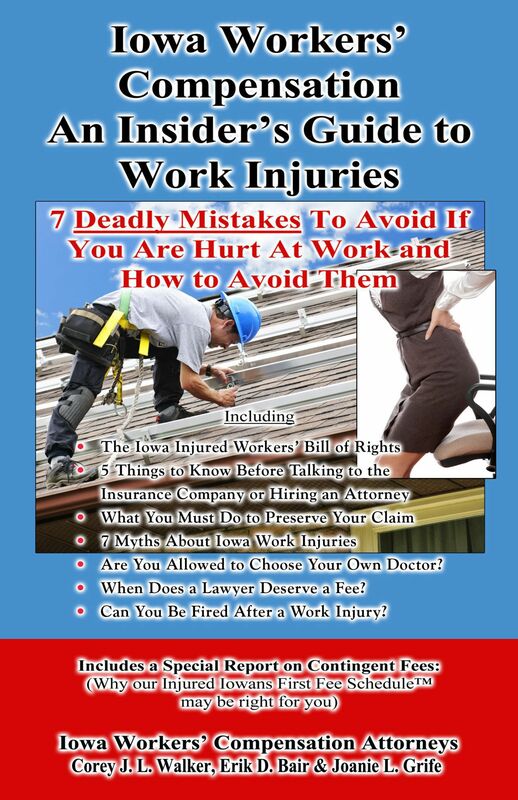 Most attorneys require you to make an appointment in order to get some of the information that we provide to you in our Iowa Work Injury book. We believe that you should be able to have this information in the comfort of your own home.